Beside its functional value, lighting is a key factor in creating a distinctive store image and highlighting the brand. It is not only enhancing the look and appeal of the merchandise, but also affects the feeling of the space itself. Applying different modules inside the luminaires with various colour temperatures and colour points enhance the attraction of products by supporting their natural colours and highlighting certain tones. On the other hand, with professional food lighting supermarkets are able to foster the in-store experience and attain customer loyalty as well. Applying different modules inside the luminaires allow us to add the suitable COLOUR TEMPERATURE of white light from warm through neutral to cold to specific areas of the store. Few things are more tempting than freshly-baked goods and tasty cheese. Often bought on impulse, they positively influence a supermarket’s turnover. The warm, brownish shades of GOLD CCT add a crispy look, enhancing the colour, while with the golden shades of GOLD+ we can achieve the ”fresh out of the oven” appearance to make sure bakery products cannot be overlooked. General lighting is the main source of illumination in a store, providing uniform lighting that allows for customer circulation throughout the space, and for the staff to perform daily tasks. Diffused general lighting ensures a sense of well-being that makes customers feel comfortable and more likely to stay longer in the store. With contrast we are able to create visual hierarchies within the retail environment. It is achieved by using an increased illumination to emphasize featured merchandise against the general light levels. Focused level of illumination is required for task areas such as counters and cash desks. Completing the sale is the most important retail task, so it is essential to enable the quick and accurate flow of payments, measurements, and the reading of tags. For this, shadows and glare need to be eliminated and we need to calculate the ideal illumination level, taking contrast levels into account between the task area and the general lighting. 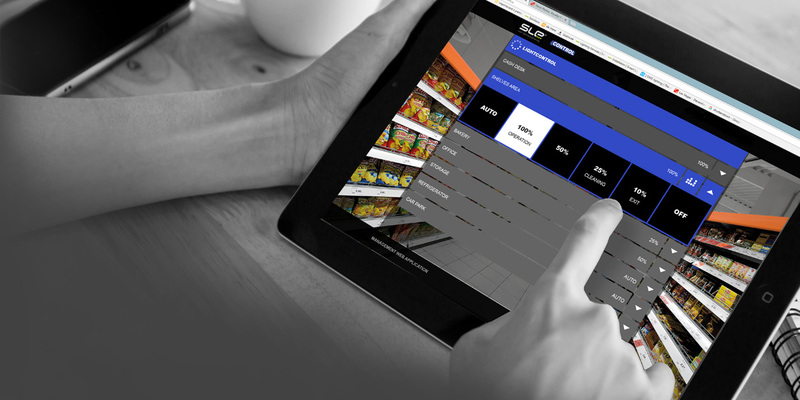 SupermarketPro is a modern solution for easy controlling and monitoring of the lighting system in supermarkets. The LMS is controlled through a Graphical User Interface that is customised according to the specific supermarket solution. 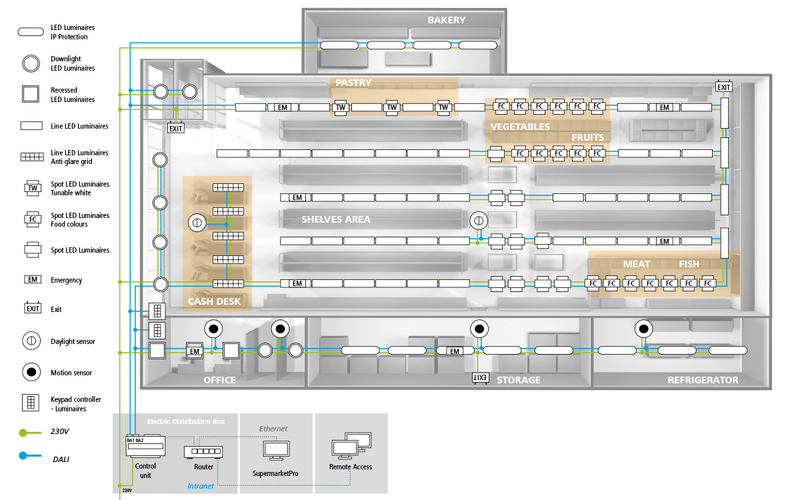 This advanced platform is designed to manage and monitor the system. Its key modules make it possible to automatically collect, store and process data; schedule switching; generate reports about the system status and savings; and send notifications about failures and system errors. Utilise a reliable, user-friendly tool that includes web control. Next to the right lighting for each specific area, we developed SupermarketPro, an easy-to-manage control system with sensors that guarantee energy saving. Presence detectors are implemented in the storage, in the refrigerator room and in the offices to make sure lighting is used only where needed. Daylight sensor ensure the maximum usage of available natural light for the visual comfort of customers and staff. Time-based control is ideal for the automatic switching and dimming of lighting according to a schedule using pre-defined lighting scenes, for instance at cleaning and restocking. Next to perfect colour rendition, applying the right light with appropriate colour temperature for fresh fish, meat, bread, pastry, fruits and vegetables is essential. Thus these areas are illuminated with Tuneable White and specific Food Colours LED luminaires developed by OMS. 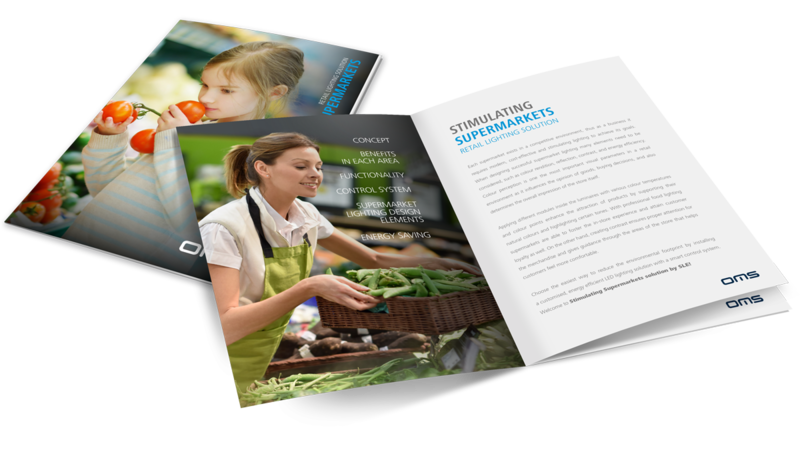 Download the Stimulating Supermarkets brochure describing the concept of supermarket lighting by OMS, with information about essential design elements, energy efficiency and smart control system. 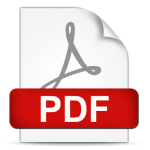 In addition, read about “Retail and Presentation” in our Right Light publication. If you need a professional presentation of the latest retail lighting solutions, contact us to rent our PlayMall mock-up. Innovative Stimulating Supermarkets solution for retail is compatible with the latest metric systems which allow to measure and analyse customer behaviour. Subsequently, the store can upgrade its layout and appearance, its range of products and services, optimise its philosophy, and eventually increase sales and nurture client loyalty. Metric systems installed within lighting is a brilliant idea as it combines the power of each tool into one powerful goal all retailers dream of: know all about the customers and use the data to sell like never before. Are you interested in metric systems?